A few weeks ago inside Elland Road I bumped into four gentlemen stood waiting by the turnstile. I referred to them in my report on that game, the 1-0 win over Millwall, as a Last of the Summer Wine tribute act. One of the men, Mr Reg French, informed me he was 85 years old and has been attending Leeds games since the mid 1930s. I saw three of the guys again prior to the Peterborough United game and they informed me that the reference within the write up caused much amusement in Mr French's local boozer. Reg himself, was unable to attend the game due to health reasons but I managed to obtain his telephone number in a bid to speak to him about his experiences watching his and our beloved Leeds United. I contacted Reg and he willingly discussed his early memories watching Leeds and what he makes of current times. We didn't cover every era but I hope you enjoy reading Reg's recollections. "We lived in Sherburn-in-Elmet by this point and my Father would take me on the bus to New York Street in Leeds. From there, we'd walk to catch a tram, somewhere near Swinegate. The trams would take the same route that the football special buses take now. We would get to the ground and my Father would lift me over the wall into the West Stand Paddock on to a huge pile of straw. "It was a shame when they stopped running the trams, I wanted to ride on the last one to Elland Road but didn't manage to do so. That would have brought so many memories back to me". "Wilf Copping was a long throw expert, we haven't had too many like him over the decades. Ernie Hart was a tower of strength at the back who once received a red card and a months ban for swearing at the referee. I also liked Ainsley and Cochrane, they scored a few goals between them but the one I remember most was Willis Edwards." "Willis Edwards was outstanding and many regarded him as the finest wing half of his day. I recall being at Elland Road and seeing him score a free kick from the halfway line, I'm sure it was the day we beat Sheffield Wednesday 7-2 in the 1935/36 season. It was a cold, wet Saturday in November, that ball would've weighed a ton!" Unbelievably, in that game, the score was 6-1 at half time. "Jimmy Frew saw some potential in me and although it was good while it lasted, I never made the grade. Ironically, Jimmy Frew also owned the sports shop in Harehills, where I was born, and he used to supply Leeds United with the football strip they wore." In 1939, after a 1-0 home defeat to Sheffield United, the Football League was abandoned due to the outbreak of the second World War. During the War, Reg worked as a railway fireman and his job prevented him from attending many games as regional competitions were introduced. 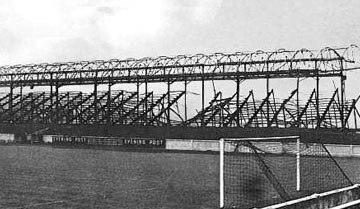 It was August 1946 when normal service was resumed where football was concerned and Leeds United were a club renowned for bobbing between the first and second divisions without making serious impact when playing in the highest tier. "The fire started in the early hours on Tuesday the 18th September, remarkably the game on the Saturday went ahead. Leeds beat Villa 1-0 thanks to a goal from the Gentle Giant, John Charles." In 1961, Reg started to take his first son Roger, who was born in 1953, to Elland Road on the Abbey coaches supporters bus. This was just before the time when the Leeds United directors would help transform the fortunes of the club by appointing the legendary Don Revie as manager. Obviously, Reg revelled in watching Revie's Leeds and holds special memories of the promotion season, 1963/64 and the celebrations at Elland Road. The crowds grew, the Scratching Shed was a special place and Reg remembers the booming chant of Leeds! Leeds! Leeds! along with the deafening sound of wooden rattles. Speaking of chants and songs, Reg laughed and told me of a time when 'Bread of Heaven' was sung during games and at Christmas time, the crowd would belt out, 'Come All Ye Faithful'. "That was a great day, the Revie team were simply brilliant. It was criminal that they never won more, some baffling decisions by referee's and the authorities saw to that. Still, there were some tremendous achievements. 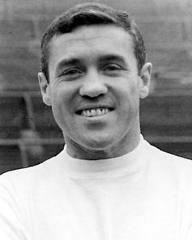 "For me Bobby Collins was the greatest player ever to play for Leeds and Albert Johanesson was outstanding. I will never forget Gray Sprake throwing the ball into his own net at Anfield and their supporters singing the song Careless Hands." Reg has always enjoyed his football but was unable to attend every home game between 1993 and 2008 as he was at home caring for his wife of 56 years, Kathleen, who had suffered from a stroke. Reg, Roger and Terry would take it in turns to miss a game and stay at home. Unfortunately, Kathleen passed away in January 2009. The only thing that prevents Reg getting to Elland Road these days is the cold weather. "I don't like the racist and abusive chanting. It's a shame that the number of away fans are restricted sometimes due to potential crowd trouble but look at our football club, it's a travesty where we are now, it's hard to see where the necessary improvements are coming from and I fear it may get worse before it gets better." Not many people alive today can lay claim to having watched Leeds over nine decades. Reg has seen it all and if you see him at Elland Road over the next few weeks, say hello and shake his hand, he's a great bloke.